An obscure Spider-Girl villain and Iron Fist wannabe. He was seen but once, in 2000. So okay, yeah, he’s kinda minor. 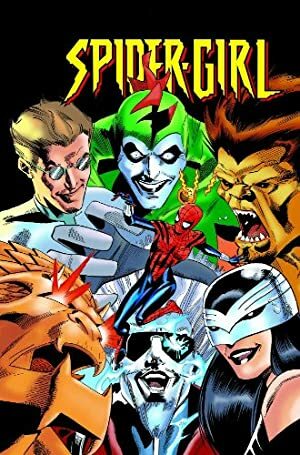 See our radioactive-blooded Spider-Girl character profile for more about the MC2 continuity. If you need context for that, I mean. Height: 5’8” Weight: 135 lbs. Dragonfist is a highly skilled martial artist. He’s also equipped with a force field belt that makes him almost invulnerable, and can reinforce his blows so he can punch through metal, or destroy a police cruiser in one strike. The belt itself isn’t protected by the force field, albeit one gets the impression that it is armoured. Iron Fist mentions that the belt enhanced Dragonfist’s martial skills, though there’s no evidence of that (and how he reached that conclusion is unclear). Our game stats assume that this statement is correct, and that the belt turns Dragonfist from a competent fighter into a cinematically competent one. Though highly skilled in the martial arts, the man who became Dragonfist worked as an assistant to Spike Yi. Yi was one of Iron Fist (Daniel Rand-K’ai)’s most talented students, and had become an action movies star. In unknown circumstances, the assistant obtained a sophisticated personal force field. He created the identity of Dragonfist as a sort of evil Iron Fist. As misdirection, he insisted that he was now the favoured vessel of the power of the dragon Shou-Lao, able to make his entire body — rather than just his fist — like unto a thing of iron. 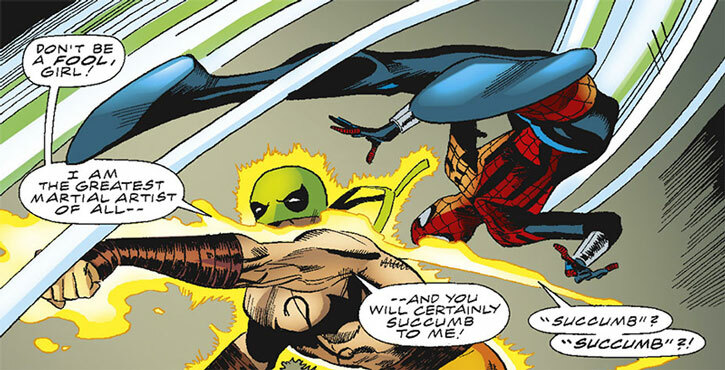 Dragonfist was eventually confronted by Spider-Girl (May “Mayday” Parker) and the retired Rand-K’ai. 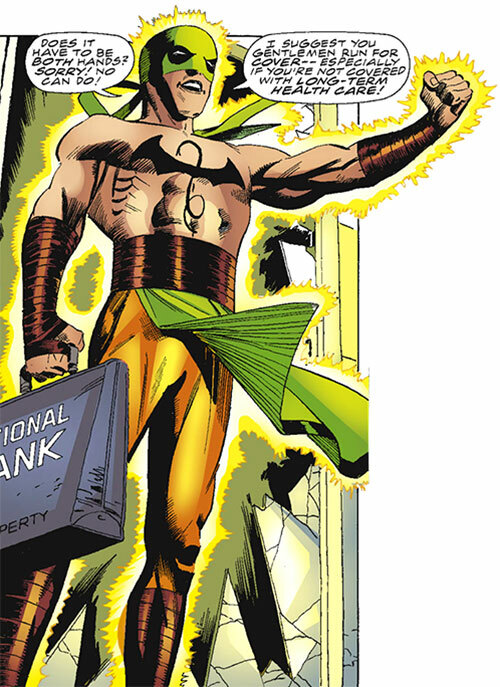 Though Iron Fist initially fell prey to the deception, Parker’s spider-sense indicated that Dragonfist’s belt was the key. Rand-K’ai punched the belt using the iron fist, destroying it and taking Dragonfist out. Dragonfist was never seen again. The Shou-Lao chest tattoo is a common one. Spike Yi made it popular and his assistants, his fans, his imitators, etc. are likely to have had one done. A basic bank robber. Dragonfist cribs most of his dialogue from kung fu movie dialogue, which he’s constantly exposed to as he shoots movies with Spike Yi as a stuntsman and sparring partner. He’s particularly fond of claiming that he’s the world’s greatest martial artist. But then who isn’t. FORCEFIELD BELT [/DEX/ 08 BODY (Hardened) 06, EV 10, Martial Artist: 07, Force Field: 08, Note: Force Field is Self Only and Can Attack Through, Limitation: the BELT isn’t protected by the Force Field, Limitation: /DEX/ and Martial Artist cannot raise existing values by more than 3 APs, Note: Initiative is 016 with the BELT on].